I officially have a TWO NEW favorite dessert ideas for weddings: a candy apple bar & a s'more bar!! I know! The first brilliant idea may seem like a fall wedding trend, but year round, who doesn't love candy apples?! The Knot posted on a caramel apple bar but I say why limit it to caramel? This fabulous idea is really catching on and there is no end to the creativity. 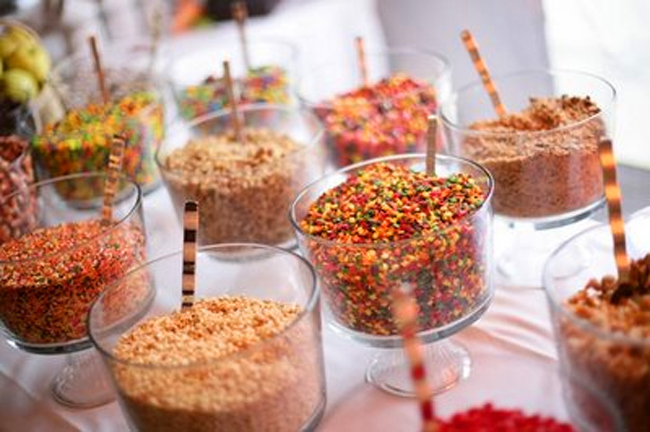 Speak with your caterer about options including caramel, milk chocolate, dark chocolate, and white chocolate syrups with various topping stations. The Ford Wedding (a Felicity C Weddings client) on September 25th wedding had their caterer custom create a s'more bar which was a HUGE hit with all ages. I was so excited when the bride told me about this plan mainly because I have a severe weakness for s'mores and I love new ideas. I can't wait for the professional pictures to come in, but I did manage to take a pic on my camera phone of the basic set up. Aside from the low quality of the picture, what you are seeing are marshmallows & marshmallow 'heating sticks', chocolate bars, graham crackers, and a custom box for the flames. Hope this inspires you for a fun dessert treat! Enjoy!